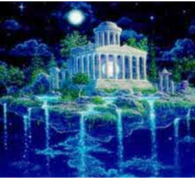 In Atlantis there were many Light temples. Each of them held a certain energy level in order to help the people take the next step for themselves. Ones own responsibility was supposed to be taken step by step. The Atlantic Light Temple Energy helps you (with green healing energy) to develop yourself further and to gently remove “old” blockages. The system revives the ancient Atlantean energies that came from the Atlantic Ocean. Many people suffer from stress. Whether in school, occupation or at home, stress is lurking everywhere. When you are feeling stressed, many times you can’t see the forest for the trees. With the help of this attunement you can fill yourself with the Atlantic energy. Prerequisite for this consecration is that you are knowledgeable with energies and have a master degree in at least one energy healing system.